This book questions the book itself, archivization, machines for writing, and the mechanicity inherent in language, the media, and intellectuals. 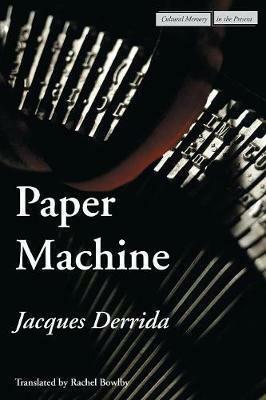 Derrida questions what takes place between the paper and the machine inscribing it. He examines what becomes of the archive when the world of paper is subsumed in new machines for virtualization, and whether there can be a virtual event or a virtual archive. Derrida continues his long-standing investigation of these issues, and ties them into the new themes that governed his teaching and thinking in the past few years: the secret, pardon, perjury, state sovereignty, hospitality, the university, animal rights, capital punishment, the question of what sort of mediatized world is replacing the print epoch, and the question of the "wholly other." Derrida is remarkable at making seemingly occasional pieces into part of a complexly interconnected trajectory of thought. The late Jacques Derrida was Director of Studies at the Ecole des Hautes Etudes en Sciences Sociales and Professor of Humanities at the University of California, Irvine. Among the most recent of his many books to have been translated into English are Eyes of the University (2003), For What Tomorrow... with Elisabeth Roudinesco (2003), Counterpath with Catherine Malabou (2003), Negotiations (2002), Who's Afraid of Philosophy? (2002), and Without Alibi (2002). All of these have been published by the Stanford University Press.